British Food is a fickle beast; we love our traditional British foods, but we also have eclectic tastes and have embraced many different cuisines and food cultures on our shores. We adore Italian Food; it is ranked as one of the favourite food styles the British choose when eating out so it is no wonder that Spaghetti Bolognese is one of our favourite dishes. It is so popular it is one of the preferred dish both in and outside the home (research circa 2011 - Alegra). 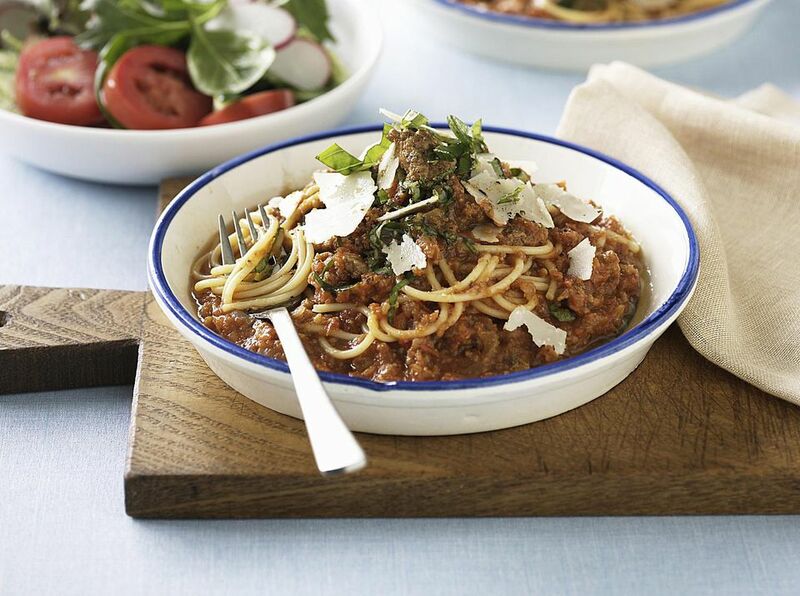 Britain has been enjoying "Spag Bol" since the 1960's when it was the dinner party dish. Everyone had their way of making it, some I am sure would make any self-respecting Italian cringe. Its popularity was also its downfall and it lost favour in the 80's and 90's but now it is back and in a big way, possibly because in trying economic times it is recognised as a cheap and filling dish, which also has the advantage of being delicious too. Choose the best minced (ground) beef that you can for a full, rich flavour. If you can make this dish a day or two earlier than needed: it will be good on the day it is made but certainly improves for keeping. Heat the butter in a large, heavy-based pan taking care not to burn it. Add the pancetta and cook gently in the melted butter to soften but not brown, about 4 mins. Add the onion, garlic, carrot, and celery, stir well in the butter and pancetta and cook for a further 10 minutes, again making sure not to burn. Raise the heat and add the minced beef, stir to break up the meat and incorporate the vegetables and pancetta. Leave to cook occasionally stirring until the meat is browned all over. Add the white wine and cook until reduced by 2/3rds, then slowly add the milk a little at a time stirring constantly. Finally, add the bay leaves, tomatoes, half the stock and a pinch of nutmeg. Bring to a boil, reduce the heat and simmer, partially covered with a lid for 2 - 2½ hours - keep checking that the bottom is not burning, and if drying out, add a little more stock or water as needed. If eating the dish immediately, check the seasoning and add ground black pepper and a little salt (take it easy on the salt as Spaghetti Bolognese is served with Parmesan cheese which is salty). If you are saving the sauce for a few days, leave to cool then cover and store, covered in the refrigerator. Reheat gently adding more stock or water if the sauce has thickened too much, check the seasoning before serving with cooked spaghetti and freshly grated Parmesan cheese.